In late 2011 I bought the Apple Macbook Air 13" (model 4,2 with 128GB SSD) to replace my aging road-warrior Dell 420. As much as I was impressed by Apple's hardware and the Macbook Air in particular, I was never taken by their software or the OSX that comes with the Macbook Air when you buy it. So within a week or so, I started experimenting putting Ubuntu (my then favorite OS) onto it. Things may have improved by then, but it was quite a task to get Ubuntu installed and set up properly - much more difficult than setting up Linux on a non-Apple laptop. The end result was a functioning but fragile setup, where each update to Ubuntu (new kernel in particular) would require me to reboot into safe mode and manually edit various files. As chef Ramsay would say, what a f...... nightmare. After 1 1/2 year and a dangerously outdated system (so many Java vulnerabilities), I decided it was time for a re-install. This time around however, I chose to try out the new favorite kid on the block, namely Linux Mint 14 with the Cinnamon interface (Unity on Ubuntu was OK, but at the end of the day more limiting than facilitating). I did prepare myself mentally for having to go through a week of cursing and sweating, but as it would turn out these concerns were entirely unfounded. First I booted back into OSX recovery (Command-R during boot) so that I could re-install OSX such as to have a completely fresh system and up-to-date firmware. The restore functionality build into the Apple hardware works very well, and remains a solid advantage to that OS - if only it was possible to provide alternative OS images this would be a killer feature. Anyway, after re-installing OSX I then wanted to re-partition to get some space for Linux. However, it turned out that you are not allowed to commit these actions in the recovery (at least I kept getting an error message) so I had to do it from the DiskUtil while booted normally into OSX. In here, I shrunk the OSX partition down to around 25GB, leaving just 2-3 GB of free space on OSX and a good 95GB for Linux partitions. That way, I could still occasionally boot OSX, but I knew from experience that I would never purposefully use OSX for my daily work. If you plan to actually use OSX from time to time, you should probable give it a bit more space than I did. While still in OSX, I then downloaded the Mint 14 image I wanted as an ISO file. Part of the trouble with the Macbook Air, is that it does not readily boot from an optical drive and it uses UEFI rather than your traditional BIOS. So one has to use a USB stick that talks UEFI, or install Windows via bootcamp (special Apple support for dual-booting Windows and OSX) and piggyback off this partition. Last time I installed Ubuntu, I used the latter method, but this time around I wanted to give the former approach a try - Windows takes an enormous amount of space after all, and I already have OSX eating up precious space. It turns out that it is pretty easy now days, I simply downloaded an application for OSX called Penguintosh specifically made for he purpose, used the tool to write my Mint image to a USB device and rebooted. While booting up, hold down the C key, so that you get to choose which device to boot from. Select the last orange USB icon and double click it. Soon you should have a Mint live image running. From within this live image, it's trivial to start installing Linux Mint to disk, since you already prepared the partition. Once installed, GRUB will give you the option of booting into Mint or OSX. You can explore countless settings for the trackpad this way, but it won't be permanent until you modify the xorg settings. I had some trouble succeeding with this the official way (messing with xorg settings file), so I simply ended up adding an entry in Cinnamons "Startup applications" applet. As with the previous command, you can just let "Startup applications" handle this by adding "xinput set-button-map 11 1 2 3 5 4 6 7 8 9 10 11 12" as an application. Another little detail I did not like, was how function (fn) keys were default over the classic F (F1-F12) keys - as a developer I rather depend on these and would prefer to control sound, brightness etc. with a combo using the fn keys. To change this, create a file in the path "/etc/modprobe.d/hid_apple.conf" with the content "options hid_apple fnmode=2". 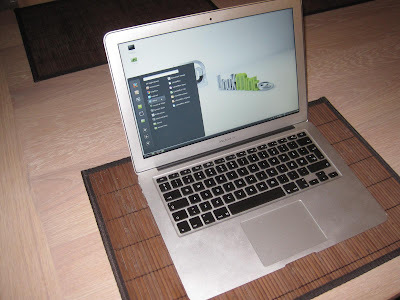 While still not as easy as installing Linux on your average laptop, this recent experience of installing Linux Mint 14 onto my Macbook Air was a very nice experience compared to all the hoops I had to go through with Ubuntu. I've come to appreciate the responsiveness and functionality of Linux Mint 14 (and it's Cinnamon UI) so much that I also plan to replace Ubuntu with Mint on my main workstation. There may still be tweaks I need to perform, but the out-of-box experience is very usable. The only real problem I've run into, is the lack of VPNC support in the network manager. Installing "network-manager-vpnc-*" has no effect in the Cinnamon interface, so if you want to connect to Cisco VPN networks, you are going to have to do it the old-fashioned way, with a command-line. What's the battery life using linux on the air? Battery life is great, I get 4h+ with my 18 month old battery. OSX is probably still a bit better in this regard (if I remember correctly, it has been a while). Hey, I have the same macbook air as you and followed your method and got an error when it tries to boot linux. This could also happen if the file system is not clean because of an operating system crash, an interrupted boot process, an improper shutdown, or unplugging of a removable device without first unmounting or ejecting it. To fix this, simply reboot into Windows, let it fully start, log in, run 'chkdsk /r', then gracefully shut down and reboot back into Windows. After this you should be able to reboot again and resume the installation. You could try to first make a bootcamp (Windows bootup/install on USB memory stick) and only THEN write the Mint image to USB (I'm pretty sure it augments rather than overwriting). Hi, I've been referencing this post as I do the same thing you did. I've got Linux Mint 14 (cinammon) on a bootable USB drive (used penguintosh to make it from an existing .iso I had). Booting goes alright, but it fails at starting the xserver display manager from the USB. So I dump out at a command prompt with some errors essentially telling me once I've fixed them, restart the display manager. I'm not entirely familiar with the ins and outs of installing linux on mac hardware so I'm at a bit of a loss. Any assistance as you have the time and inclination would be much appreciated. I have a Macbook pro and I'm using Ubuntu 12.10 without unity, I use cinnamon, but sometimes the system sents crashes, I don't convinced tha ubuntu is the best distributions for MAC, do you believe that linux mint is better for may MAC. I have installed mint 15 RC on my MBA 4.2 and I'm having problems with cpu temp (normally around 65ºC but often over 80) and battery life (2h max). Macfan and TLP ara running, and I did the installation using Refit. Funny enough in my case the two finger scrolling worked o-o-box, just needed to activate this option via the control panel. I've tried few linux distros on my 2012 macbook air. First, I was happy with mint mate 14. minor issue is loud fans. Then replace it with ubuntu which was the worst. So I switch back to ubuntu server with install the minimal lubuntu to use less resources. It was good in the beginning but had kernel panic which I was lazy to fix. Then, I decided to put on xubuntu on top of ubuntu server, very lightweight and fast but same issue of kernel appeared. Finally, I fresh install linux mint 14 xfce. I can't talk enough about it. I think it's the perfect OS for macbook air. the only downside is the battery life, I get up to 4 and half hours. I somehow manged to get up to 6 hours in linux mate but I forgot how I did it. During the installation of Mint where did you tell Mint to put the boot loader?